I wanted to let you know that WindCheck has full East Coast distribution. As it turns out, the owner of a Baltic in Groton, CT brings her to Florida during the winter to race on the Indian River. One of his Floridian crew had mentioned that he was interested in a Rodgers 26 that was for sale. 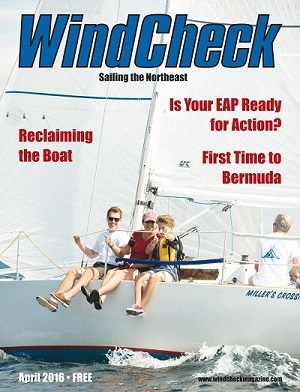 The timing of the April cover was perfect as the Baltic owner provided the April issue to his crew and we connected through WindCheck to discuss my Rodgers 26. Your magazine is a great source for Northeast sailing and I wish you continued success. P.S. My son Christian was really jazzed when he saw the cover and can’t wait for another season to start!